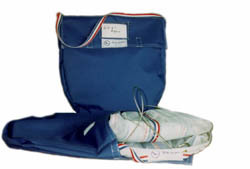 SEA-GEAR Net Storage Bags are made of top quality mildew resistant codura. The bag will protect, transport and store at least two SEA-GEAR Plankton Nets. It is equipped with an extra long carrying strap, a clear plastic window containing a product identification card, Velcro closing tabs and bottom drainage holes. Custom instrument bags for mooring or transport applications are available from SEA-GEAR. SEA-GEAR drouges, manufactured from heavy duty vinyl promise years of service and maximum location stability.